I’ve said this before… my favourite books are those where nothing much happens other than whole worlds change. Oh my lord did I love this book of nothing and everything. Louis Waters and Addie Moore are widowed, long time neighbours, who really only have a passing knowledge of each other’s lives, in the way of neighbours who have shared a street for decades. Aware but not involved. They’re both good people. And, now, perhaps, also lonely. The book opens with Addie knocking on Louis’ door and asking if he would be at all interested in sleeping with her. She means it literally. No funny business, just pj’s and slumber. Oh, and talking. That’s really what she’s looking for, that special kind of conversation that only happens when you’re lying in bed next to someone. He continues to live in his own house in the same way he’s been doing for years, but at night he goes over to Addie’s for a single beer while she has a glass of wine and then they brush their teeth and hit the hay. Once in bed they talk. At first, of course, it’s all awkwardness, but it evolves into something so essential to their well-being that neither of them can imagine living any other way. They’re not a couple but they’re more than friends. They come to reveal everything to each other in ways they never did in their marriages. But people being people soon begin to pass judgments, especially those people unhappy in their own lives. Louis and Addie don’t give a fig. If anything the judgements only cause them to judge themselves (which is such a healthy reaction) and when they don’t find anything sinister about themselves they take it up a notch and begin hanging out together in public. Not necessarily an easy decision given how the elderly are made to feel they don’t count, that they hardly have a thought in their heads worth hearing. Addie and Louis know this is the way old people are seen but they don’t see themselves or others this way. They have such wonderful, admirable balls. A really charming part of the book is when Addie’s six year old grandson Jamie comes to live with her while Addie’s son Gene and his wife try to fix their marriage. Louis and Addie and the boy become a kind of family unit (along with Ruth, a friend of Addie’s) and Jamie is nourished in a way he’s never experienced. He stops crying, he’s able to sleep at night. Life is good. All of which royally pisses off Addie’s son when he hears about all that happiness. He decides to pay a visit, assumes (the truly wonderful) Louis has nefarious intentions, chastises his mother for her lifestyle and takes Jamie back home well before his marriage is anywhere near fixed. Then he forces Addie to choose between her relationship with Louis and her relationship with her grandson. This is one of those deliciously slender books, easily read in a day, spare writing yet saying all that needs to be said, in the way of the best conversations. Satisfying to the core. I would read this one again and again for the layers it reveals and the questions it asks us to consider about family, friendship, intimacy, community, loyalty and aging. For starters. Haruf is new to me but I’m already looking for more of his earlier work. Available online at two of my favourite indies — Hunter Street Books and Blue Heron Books. Yes! Yes! Yes! One of my favourite books – and writers! – of all time! 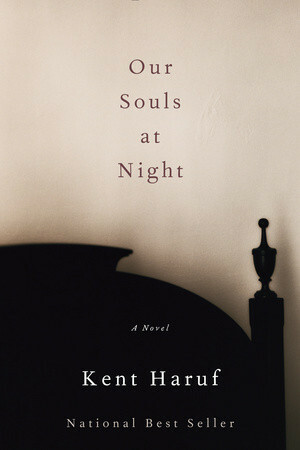 You will love all of Haruf’s novels, so understated, yet full of grace. I was so sad when Haruf died (followed soon after by another favourite, Ivan Doig), but they both left us with beautifully written books that will stand the test of time. Hint … Read “Plainsong” next. And this is one time when I think the movie, being released soon, has the potential to be as good as the book. So looking forward to reading. Thank you for the triple-yes enthusiasm (and further recs!). All his books have that quiet grace, set in places where ordinary people live ordinary lives, and live them with sorrow and joy, kindness and confusion. I’m happy to hear this. What a joy to find a new writer to love. Am looking forward to ‘Plainsong’ but can’t imagine loving it more than ‘Our Souls at Night’. I’m a sucker for exquisitely rendered skinny books. I want to read this right now!!! Thanks, Carin. This is a book, and a writer, I’m going to enjoy. Thanks, Leslie! Haven’t yet opened the link and, no, I didn’t realize he was dying tho’ now that you mention it I remember something about a ‘sense of urgency’ he felt as he wrote. All the more powerful somehow I think… I’ll look forward to reading this. I hope you enjoy the book. I borrowed it as an e-book the same day and basically inhaled it. And the reviewer was right – I liked it for much the same reason I like John Prine. Now on the lookout for more of his books. Thank you for the recommendation.